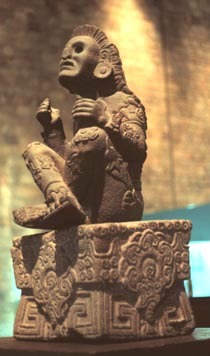 The table below presents views of a variety of artifacts from the ancient civilizations of Mesoamerica. 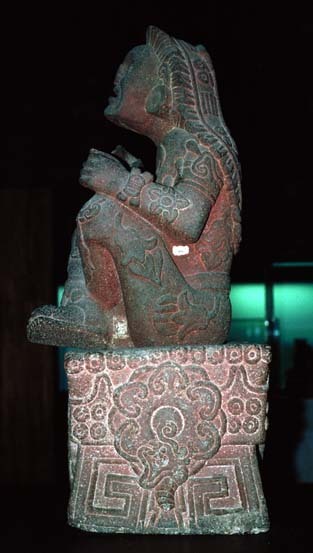 All the items are from Central Mexico, west of the Isthmus of Tehuantepec. Special thanks to the National Museum of Anthropology for permission to photograph for educational purposes. Each thumbnail photo is a link to a larger version of the same photograph. 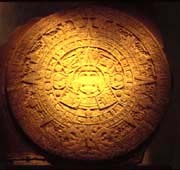 The largest Calender stone from Central Mexico hangs on the wall in the National Museum of Anthropology in Mexico City. Also in the museum, a calender stone is carved atop this monolith depicting a teocalli, an ancient pyramid. The sides feature glyphs. 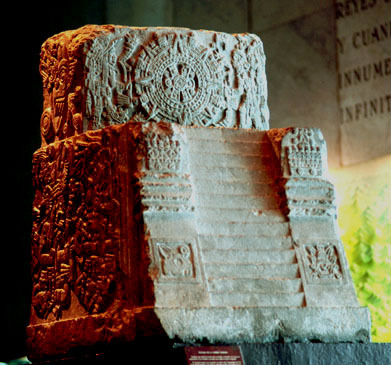 A model of the Aztec city of Tenochtitlan's central monument district is on display in the same room of the museum as the two stone sculptures shown above. A large mural on the wall shows the city and causeways leading to the great metropolis. The entire city was leveled by the Spanish invaders. 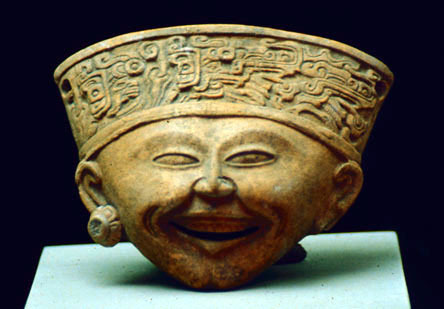 A gleeful expression is typical of a style of ceramic masks from the Gulf Coast region of Mexico. This unique style of ecstatic faces are featured on both masks and full figure sculptures. 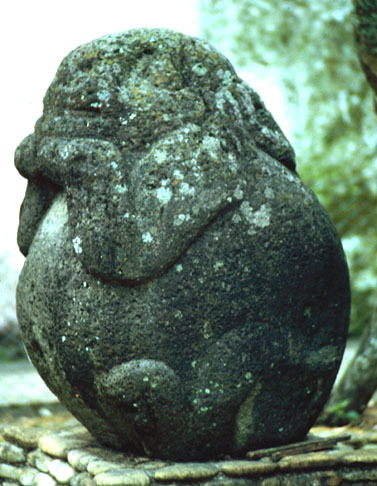 A stone sculpture in a park in Misantla, Vera Cruz depicts a rabbit's features emerging from a flattened spheroid. This image probably represents the moon. The sculpture was removed from the nearby pyramid complex of Los Idolos. 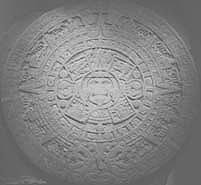 Stone spheres, other carvings and a stela are known from Los Idolos. 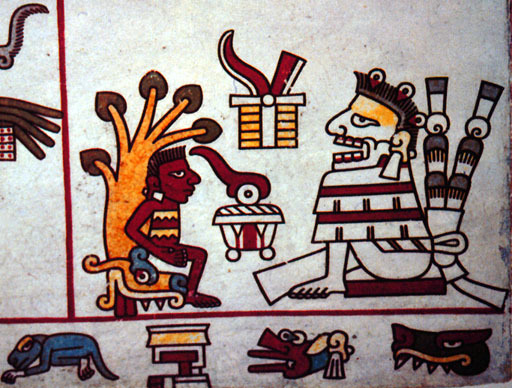 This page in the Codex Laud depicts a human seated on a Tree of Life glyph. 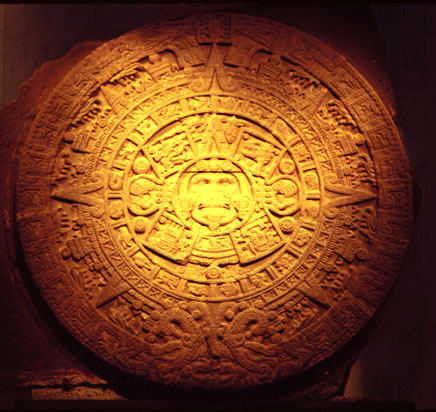 The pictographic screen folds from Central Mexico and from the Maya region are of distinct styles, although the calender, number and other conventions are the same. The so-called 'Xochipilli' stone sculpture in the Museo Nacional de Antropología. Xochipilli is the numen of flowers in the prehistoric tradition. 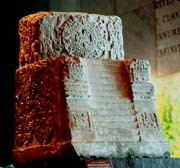 One of the original statutes found buried inside the Tula pyramid, now on display in the National Museum of Anthropology.